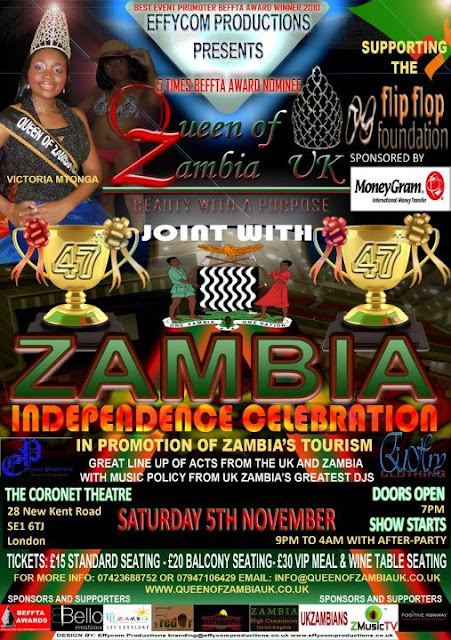 Home / Change / Event / Queen of Zambia UK / Schedule / QUEEN OF ZAMBIA UK EVENT SCHEDULE CHANGE TO 5TH NOVEMBER 2011...!!! QUEEN OF ZAMBIA UK EVENT SCHEDULE CHANGE TO 5TH NOVEMBER 2011...!!! I am some rather not too great news however not to fret as we have had to find a resolution to it. It has transpired that the Light house Hall double booked our event (that’s what we get for trying to support black people) lol In light of this we have had to change venues and as we have been given such short notice we have had to push the event back by a week to the 5th of November with the same start time, rather disappointing but it is better than a full cancellation and the best we could do under the circumstances. For our film and photography crew and make-up artists this is a slight advantage as the new venue has 3 changing rooms and 2 production rooms with the same state of the art equipment as the Lighthouse likely better. Please see the attached tech form. Apologies to anyone that has to be inconvenienced due to this however it is a situation beyond my control and the best we can do as an organisation is to find alternative means.